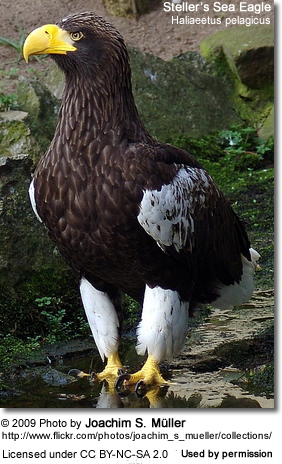 The Steller's Sea Eagles (Haliaeetus pelagicus) - were named after the 18th-century German explorer and zoologist Georg Wilhelm Steller. These large fish-eating birds of prey are considered to be one the most powerful of all eagles; and they are the heaviest eagles in the world, averaging about 4.9 to 9 kilograms (11 to 20 lbs) in weight. Bald Eagles, for example, weigh about 3.6 - 6.3 kg (8 - 14 lbs). 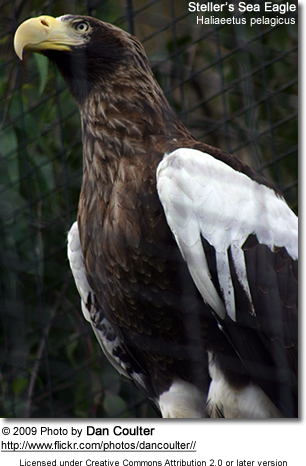 These yellow-beaked eagles are about 3 feet tall (1 meter) and have a wingspan of more than 7 feet (2 meters). 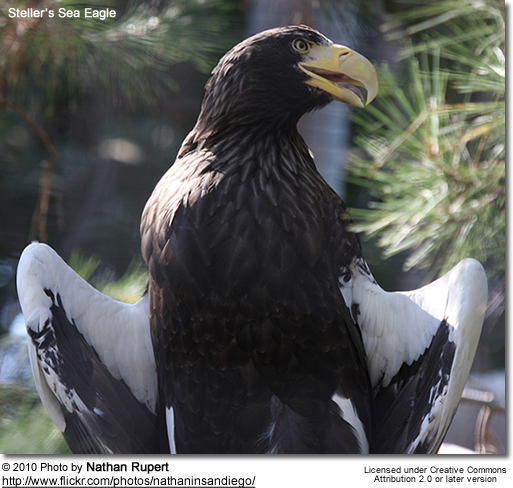 Steller's Sea Eagles are migratory birds that breed on the Kamchatka Peninsula, the coastal area around the Sea of Okhotsk, the lower reaches of the Amur river and on northern Sakhalin and the Shantar Islands in Russia. For the winter, most of them will move down south to the southern Kuril islands and Hokkaidō, Japan. Rare vagrants have also been recorded in North America that have strayed too far from their local range in Asia. They inhabit seacoasts and rivers and is often seen perching on sea cliffs or trees waiting to swoop down on its prey, which is mostly fish, although they will also take small mammals. These birds are endangered and only about 4,200 breeding pairs are believed to exist worldwide. They are classified as Vulnerable, as they are threatened by habitat alteration, industrial pollution and over-fishing. 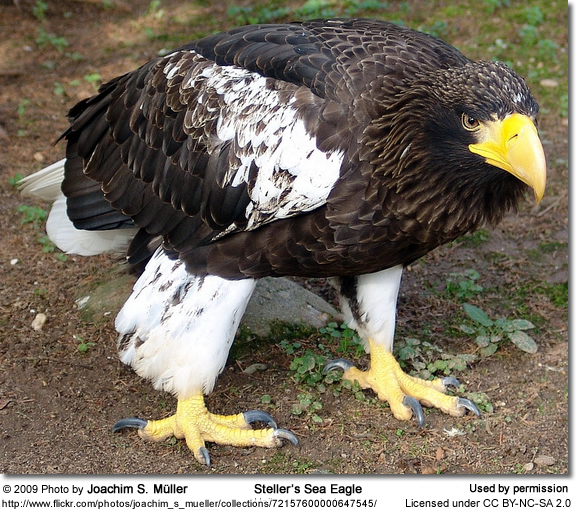 Stellers' Sea-eagle measure 86.5 - 105 cm (34.1 - 41.3 in) in length (including the tail) and have a wingspan of about 203 - 241 cm (80 - 95 in). Females are usually heavier, weighing6.8 to 9 kilograms (15 to 20 lbs), while males weigh from 4.9 to 6 kilograms (11 to 13 lbs). The skull and bill are the largest of any eagle. Adults have a mostly blackish-brown plumage with some paler streaking. They have large, distinctive shoulder patches, long leggings, wedge-shaped tails, and small forehead and crown patches. A dark morph without the white shoulder markings also exist; but is very rare. Their strong beaks are arched and yellow. The eyes, cere (skin above the upper bill) and the unfeathered feet are also yellow. Their powerful, curved talons and rough pads are well adatped for grasping slippery fish and other prey. Both the legs and the bill are bright yellow. Juveniles are mostly dark brown with lighter mottled feathers. Their eyes are dark brown and their bills are orange. They attain adult plumage when they are about 4 - 5 years old. 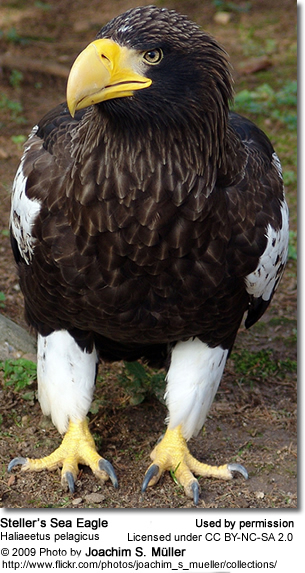 Steller's Eagles are believed to have a lifespan of about 20 years or more. 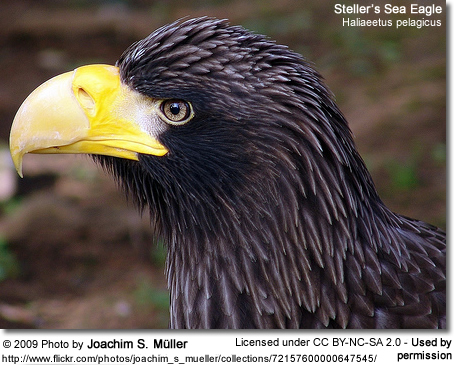 Steller's Sea-eagles mostly feed on fish, favoring salmon, trout and cod. They will also take water-dwelling birds, such as ducks, geese, swans and gulls); as well as preying on mammals, young seals, crabs, squid and carrion. The breeding season usually commences in February or March, with egg laying occurring between April and May. This eagle builds several large nests (referred to aeries) that are about 150 cm tall and have a diameter of up to 150 cm. The nests are placed high up on trees and rock. The eggs are white-green in color and are incubated for about 39 - 45 days. Usually only one chick survives. The hatchlings are covered with an ash-grey to white down and brown feathers start growing when they are a couple of weeks old. When they are about 10 weeks old, they fledge (learn to fly). The immature birds reach reproductive maturity when they about four to five years old; however, they attain the full adult plumage only at age eight to ten years.